Willie Jermaine Smith, age 32, transitioned this life on Sunday, December 2, 2018 in Hattiesburg, MS. He was born at Forrest General Hospital in Hattiesburg, MS on April 28, 1986 to the late Mr. Willie James Smith, Sr. and Mrs. Lula Smith Scroggins. 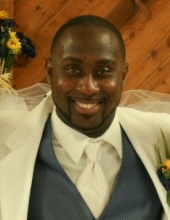 Jermaine attended Earl Travillion Attendance Center and graduated from Petal High School in the class of 2004. He married the love of his life, Ashley Joy Smith, on June 1, 2014. Jermaine was employed at Kohler Engines at the time of his passing. Jermaine was known to have a fun-loving, competitive nature and enjoyed playing basketball and working out. He was an avid New England Patriots fan and could be found cheering them on enthusiastically. Jermaine will be remembered for many things, to include his boundless love for his family and friends and his gigantic personality. He was gifted to always make those around him laugh and have a good time. If he saw a problem, he did his best to fix it. Jermaine also had the unique ability to see and bring out the best in any situation. Jermaine was preceded in death by his father: Willie James Smith, Sr; paternal grandparents: Alex and Irma Smith; maternal grandparents: Ellis and Elvie McCray; oldest brother: Willie James Smith, Jr.
Jermaine is survived by his wife: Ashley Joy Smith; children: Kileigh Alexis Smith, Makayla Laniece Newman, Arianna Lachelle Calvert; mother and stepfather: Lula Smith Scroggins and Ben Lee Scroggins; Siblings: Carlos (Tamika) Smith, Sherika Denise Smith, Dominique Lashuna Smith: Older Brother/Sisters: Lamar Smith, Melody Smith, Meronica Smith Herring; Aunts: Maudell Tarvin, Jessie McCray; Nephews/Nieces: Jakolby Smith, Chloee Smith, Ny’Brianna Smith, Darius Smith, Aubree Edmond, and a host of other relatives and friends. Visitation will be Friday, December 7, 2018 at Priest Creek Missionary Baptist Church from 11:30 a.m. until 1:30 p.m. with services immediately following at 1:30 p.m. Burial will be in South Hill Cemetery. To send flowers or a remembrance gift to the family of Willie Jermaine Smith, please visit our Tribute Store. "Email Address" would like to share the life celebration of Willie Jermaine Smith. Click on the "link" to go to share a favorite memory or leave a condolence message for the family.